Based on the lettering used on USN aircraft carrier islands. MD USN Carrier Island Lettering - Sample. Based on the lettering used on USAF Sabre aircraft following WWII. MD SabreUSAF - Work in progress sample. Based on MIL-M-11745D. Lettering for Army marine craft. MD USArmy Vessel - Work in progress sample. 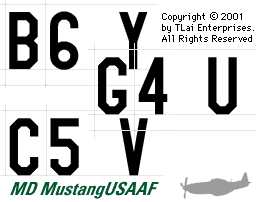 Narrow-style marking font for European Theatre USAAF P-51 Mustangs. MD MustangUSAAF - Sample of current proofs, using markings from the 357th Fighter Group. No date for completion has been set. Modeled after the Star Wars ® title logotype. View sample made with prototype. To keep up on new releases, subscribe to the TLai Announce List. To subscribe, just enter your name and e-mail. A message will be sent to verify your subscription - to complete the subscription process, you must respond from the e-mail you intend for announce messages to be sent to. This additional step is to prevent bounced messages, and to make sure you were the one that subscribed your address. All trademarks the property of their respective owners. Copyright © 1999-2010 by TLai Enterprises. All Rights Reserved.